When you arrive in Trieste from the panoramic Coastal Road, you reach the city's maritime neighbourhood of Barcola. During Roman times, this long strip of land overlooking the sea but protected from the Bora wind, was dotted with villas. Today, the ruins of Villa Giulia are still visible inside the Lapidario Tergestino in San Giusto Castle. In the mid-1800s, the upper classes started building their mansions in the area and those buildings can still be seen today along Viale Miramare. Among them, Casa Jakic, which the locals refer to as "the onion house". 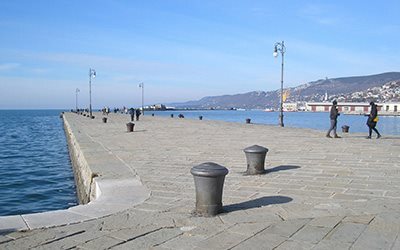 What really catches your eye when you enter Trieste through Barcola, is the number of people on the beach. Each area has its name: starting from the Miramare crossroads, then Marinella, California, Molo G, the famous Topolini (ear-shaped platforms) and Pineta. The beach is swarming with people not just in the summer, but as soon as the temperature allows it, and as long as the sun is out! In fact, here the warm season starts in April and ends in October. In Trieste, people keep a sun lounger in the car (or on their motor scooter), so it's ready if they need it during their lunch break! Instead, during the winter months, it is a nice place for long, evocative walks and the ideal spot to enjoy beautiful sunsets. Barcola also lends its name to the most crowded regatta in the Mediterranean, the Barcolana, held every second Sunday of October since 1969, and organised by the yacht club Società Velica di Barcola e Grignano.